The Fifth Parliament term ends on 6 May. According to the Constitution, elections must take place within 90 days after that, so no later than 5 August. The election date has not been proclaimed but indications are that it will be in May. In the remaining days of the Fifth Parliament, political decisions will have to be made about what outstanding parliamentary business can be dropped due to lack of time as MPs actually depart by 29 March 2019 to go and campaign. However, MPs can be called back for "emergency" business right up until 6 May. If one recalls, this did happen at the end of the Fourth Parliament in April 2014 when MPs had to return to scrutinise former President Zuma’s response to the Public Protector’s report on Nkandla. 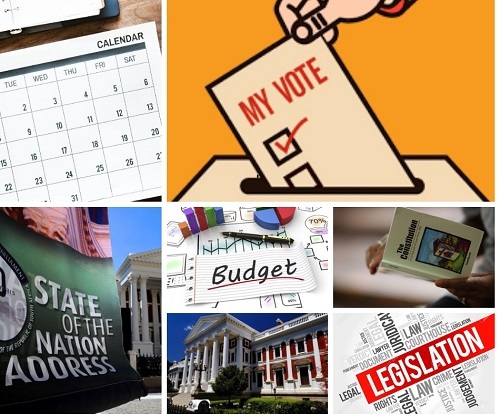 The State of the Nation Address is on 7 February and the Budget Speech on 20 February. There is no gentle introduction to this final session as MPs deal with several major items. Top of the agenda is for Parliament to table, process and pass a Constitutional Amendment Bill before the end of the 5th Democratic Parliament in order to allow for expropriation without compensation. At its last sitting in 2018, the National Assembly established an Ad Hoc Committee to initiate and introduce a constitutional amendment and report back to the House by 31 March 2019. The ANC concedes that the deadline is ambitious but if it is not completed it wants a progress report from the Ad Hoc Committee. Heated, divisive debates (both in and outside of Parliament), legal challenges (or threats of legal challenges) have been a feature of this entire process so far. Predictions are often difficult to make but in this instance it’s easy to forecast.... things will continue in the same vein and possibly escalate as we get closer to the election. The other immediate priority is the important appointments that Parliament must make. These include filling vacancies at the SABC, CGE, MDDA, PanSALB and confirming a new IPID head. There are 62 Bills in Parliament so there will be a big push to put the finishing touches on as many of them as possible before the legislature’s term expires. This is in keeping with previous cycles where the majority of Bills are passed in the dying days of a parliamentary session. Given the time constraints, one question stands out: will these outstanding Bills be subjected to proper scrutiny and ultimately survive any constitutional challenge? Key pieces of legislation which are expected to be finalised this term include the Hate Crimes and Hate Speech Bill, National Credit Amendment Bill, Cybercrimes and Cybersecurity Bill, Carbon Tax Bill, Critical Infrastructure Protection Bill and Traditional Courts Bill - barring political decisions to halt them. Parliament has other pressing issues to address: publishing the 2018 Registrar of Members Interests and its Fifth Term Legacy Report as well as finalising state capture investigations and outstanding ethics inquiries. Of course, the election results will determine the composition of the new Parliament and its trajectory: how many parties will be represented and who will have the majority? According to the IEC, nearly 300 parties have registered to participate in the elections. When the Sixth Parliament is sworn in, the legislature can look very different to the current one: there could be more women, younger MPs, fewer and/or new parties, higher turnover rate of MPs and a reduced majority for the ANC. As parties put together their lists and people jockey for positions, it is worth reflecting on this. Depending on the result, it’s possible to imagine a stronger and more vibrant Parliament or a weaker one. The planned reconfiguration of government (assuming the ANC wins) will impact on Parliament. In the National Assembly, there is a corresponding oversight committee for each government department. If several departments are clustered, then the same will apply to the relevant committees. Organisationally, the new Parliament will immediately be preoccupied with the following: appoint parliamentary leadership, hold a second State of the Nation Address, set up new structures, orientate/train all MPs and formulate a five-year strategic vision for the institution. Other tasks include electing a new President, passing department budgets, making new appointments (Deputy Public Protector, Parliamentary Budget Office Director and Registrar of Members’ Interest) and beginning its oversight and legislative work. Hold on tightly, it’s going to be a loud, interesting and unpredictable year.